Now that Infinity War has settled into theaters and Ant-Man 2 is on the way, the thirst for Avengers 4 knowledge is getting out of control. Within the Marvel Cinematic Universe, there's a lot of foreshadowing, sometimes years in advance, which seems to be the case with an Avengers 4 clue from 2015's Ant-Man. After Thanos completed his mission in Infinity War, the population of the universe was cut in half, leading to a lot of speculation about how the original Avengers will figure out a way to save the day in Avengers 4. Time travel seems to be the consensus of the majority of the Avengers 4 theories, especially after Doctor Strange's sacrifice. Additionally, we've seen some behind-the-scenes pictures from the set that feature the original Avengers in their suits and haircuts from the first movie with a device on their wrists during the Battle of New York along with Paul Rudd's Ant-Man, who was not present at that time in the MCU. But it might not be just as cut and dry as regular time travel. 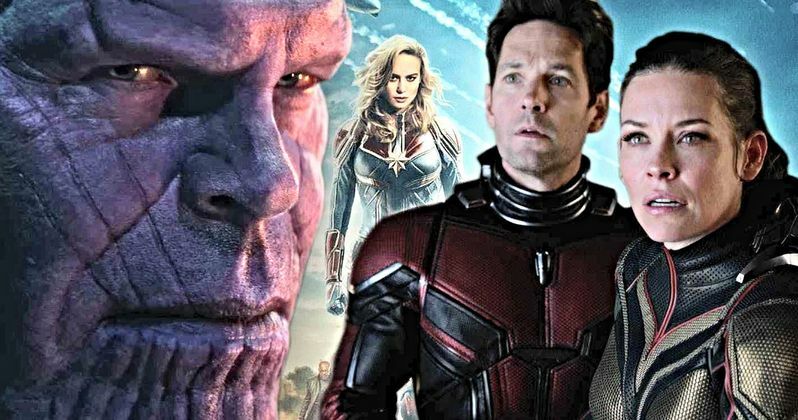 Infinity War screenwriters Christopher Markus and Stephen McFeely have already said that Ant-Man and the Wasp will play a major part in Avengers 4 along with the upcoming Captain Marvel, which makes a quote from Michael Douglas' Hank Pym from the first Ant-Man all the more memorable. When Pym is trying to first describe the Quantum Realm and going subatomic to Scott Lang, he brings up something that could really help out the Avengers and their second battle with Thanos. Hank Pym says this about going subatomic in the Quantum Realm. "It means that you would enter a reality where all concepts of time and space become irrelevant as you shrink for all eternity. Everything that you know, and love, gone forever." In the first Ant-Man, Scott Lang successfully made it out of the Quantum Realm, much to the surprise of Hank Pym and Hope van Dyne. This information sets up Ant-Man 2 as they prepare to venture back into the Quantum Realm to search for Janet van Dyne, aka the Wasp, who has been trapped there for decades. The trailers for Ant-Man 2 even feature the craft that Hank Pym developed to explore the Quantum Realm, which seems like it would be really helpful to the original Avengers as they look for a way to go back in time. Captain Marvel will also factor into the Quantum Realm, but it isn't clear how at this time. Since Carol Danver's big screen debut takes place in the early 90s, it could be used as a way to bring her to the present day after Nick Fury sent out the message at the end of Infinity War. Whatever the case may be, it looks highly probable that the Quantum Realm and Hank Pym's technology will be the key to bringing everybody back while making new sacrifices along the way. This theory was first reported by MCU Cosmic.